With over 50 years of experience, Crawford Packaging is a leading packaging expert. We work with our clients to establish cost-effective and impactful packaging solutions that increase efficiency and decrease waste. Crawford Packaging believes that proper packaging is essential in controlling costs and managing waste. That is why we offer our customers complete packaging solutions that fit their business needs and goals. Crawford Packaging’s highly-trained Packaging Specialists will work with you to perform a pack/cost analysis to fully understand your products packaging needs and processes. The analysis will help our specialist determine how Crawford Packaging can improve your existing packaging solution. Improvements could include the addition of automation, upgraded packaging equipment or more cost-effective packaging materials. Crawford Packaging is the only turn-key, full-service packaging equipment, and consumables supplier. We work with world class manufacturers to establish best practices for all our packaging equipment and materials. Our Packaging Specialists and Technicians use this to build and install complete, optimized packaging solutions. By optimizing machine and material use we help reduce packaging waste, cut costs and improve consumption. At Crawford Packaging, we consider ourselves to be experts in secondary packaging. Secondary packaging makes sure finished products arrive at their destination safely, in as made condition. Proper secondary packaging acts as a protective buffer for your products during transport. This buffer can be in the form of internal or external protections. Internal protections include packaging materials like bubble barriers and packaging peanuts. External protections include packaging films and cases that provide improved protection and increase load stability for transportation. We work with world class packaging equipment suppliers to offer our clients the highest quality packaging machines available today. This has led to Crawford Packaging being the first to market with new packaging machine technologies. We test all of our packaging machines to the highest standards for both product and operator safety. Our team of highly skilled Technicians install, update and repair all our packaging machine brands and models. Our factory trained service team consists of skilled and certified Millwrights and Electricians capable of working with all aspects of your packaging machine including mechanical, pneumatic and hydraulic. Our service team will work with your in-house teams to establish proper training and maintenance practices. With proper care, your packaging machines can last you a lifetime. We source the highest quality packaging materials available on the market today. We offer our customers a wide selection of options guaranteeing we have the materials to fit your budget. Our commitment to offering cost effective packaging solutions is spear headed by our Crawford Guardian Private Brand. Crawford Guardian products are manufactured to our exact specifications and quality standards. Each of our Crawford Guardian products are the best in class and meet or exceed accepted packaging standards. Do you need a custom package? Does your product not conform to standard sizes and shapes needed for off the shelf packaging? At Crawford Packaging, our Packaging Specialist will work with you to develop, test and implement a custom secondary packaging solution for your products. Whether you require branded stretch films or die cut boxes we have the options to help your products stand out. We have worked with companies to develop impactful packaging solutions since 1980. Our material handling procedures and quality control standards have helped us to achieve an industry leading fill rate with our customers. Our high-quality standards and extensive packaging experience has earned us a standing as a leader in the industrial packaging market. Crawford Packaging works with world class equipment and materials partners to provide clients with efficient and cost-effective packaging solutions. This has led to the development of innovative programs such as the Crawford Pillars. Our Packaging Specialists will analyze existing packaging practices for opportunities to improve film use. Crawford Packaging works with our partners to offer innovative packaging solutions to our clients. Our commitment to quality has led to Crawford Packaging being an accredited ISO 9001 business since. We work with an established and documented quality management system that is regularly reviewed for improvements. Helping us to ensure that all of our products conform to all industry and contractual requirements. 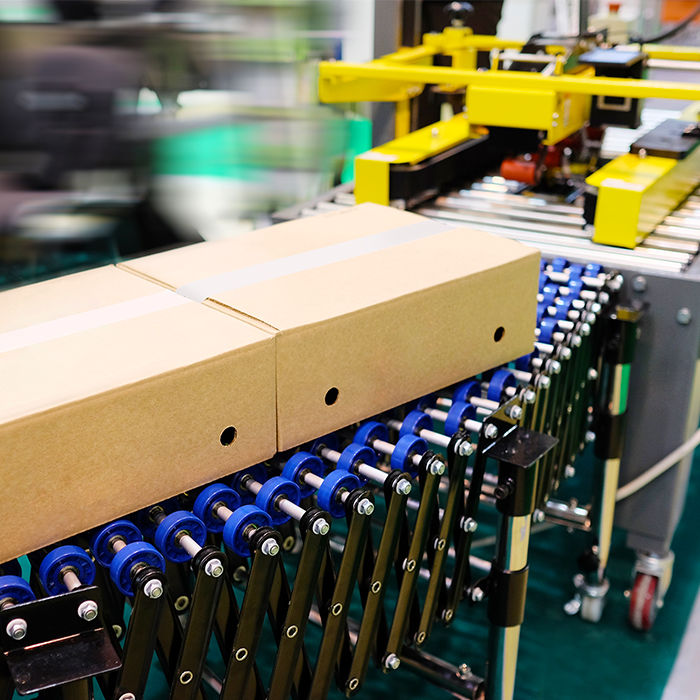 A general manufacturer was seeing rapid growth, but their packaging process couldn’t keep up. A Crawford Packaging Specialist recommended Tape It Right — learn how it made a difference. How Tape It Right eliminated product loss in transit with water-activated tape and the Better Pack 333 tape dispenser for a Manufacturer in Waterloo. How we helped a pet food manufacturer improve their automated carton forming and sealing solution with Tape It Right and a tape head maintenance program. How we helped a National Auto Parts Supplier reduce their packaging tape cost and increase productivity with a Semi-Automatic Case Sealer. How we helped a National Paper Manufacturer improve their stretch wrap throughput and damage rates with Wrap It Right and high strength stretch film. How we saved a manufacturer $3,000 annually and increased their pallet wrapping productivity through alternative solutions and out of the box thinking. How Crawford Packaging helped a manufacturer improve carton forming productivity through the addition of a new Semi-Automatic Uniform Case Erector.